Dorset-born George Blogg has worked in world-class restaurants, establishing a style that is classical at its core, natural in its execution. 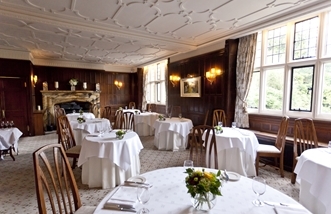 His cuisine can be sampled at the award-winning Gravetye Manor in Sussex, where he’s head chef. George Blogg’s résumé is an impressive read – he’s worked at two Michelin-starred restaurants: with Philip Howard at The Square in Mayfair and under David Everitt-Matthias at Le Champignon Sauvage in Cheltenham. “I’m very fortunate to have worked with both of them, they really are two of the most well respected English chefs working in kitchens at the moment,” he says. There have been stages at esteemed eateries Le Manoir aux Quat’Saisons in Oxfordshire; The Ledbury in Notting Hill; and Noma in Copenhagen – all champions of locally sourced and foraged produce. Then there was a fruitful tenure as executive chef at Hotel TerraVina in Hampshire before moving on to Gravetye Manor, an Elizabethan mansion that was awarded AA Hotel of the Year England 2013-14. A combination of classical training and observing mentors has formed George Blogg’s gastro-philosophy. While he’s reluctant to pigeonhole himself, believing that it’s important to “be a bit chameleon-like” he has the presence of mind to play to his strengths. George Blogg’s cuisine echoes the milieu of his workplaces, and this is none so apparent then at Gravetye: “I want [the food] to reflect what’s outside the window, what we’re growing, what’s being shot, what’s being picked – reflect the natural environment,” he explains. And what an environment it is – Gravetye’s renowned grounds were designed by pioneering Victorian landscaper William Robinson, whose legacy lives on. 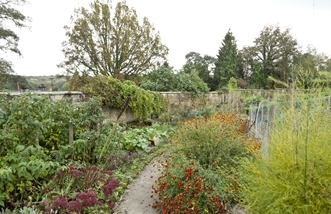 The kitchen has access to a one-acre walled produce garden, the bounty of which is integral to George Blogg’s creations. There are only a few restaurants in the UK able to exploit gardens such as this: the chef cites L’Enclume, Le Manoir and Gleneagles. “Utilising the gardens, foraged produce, smokehouse techniques and sourcing the best ingredients through superb local suppliers are in line with my principles,” the chef told The Caterer, so dining at Gravetye focuses on those four elements. The AA writes about the cuisine’s “modernist style [that explores] novel combinations and textural contrasts” and applauds the vegan menu – an inspired use of the goods to hand. The Michelin Guide 2015 highlights the “accomplished cooking” and “innovative” desserts. 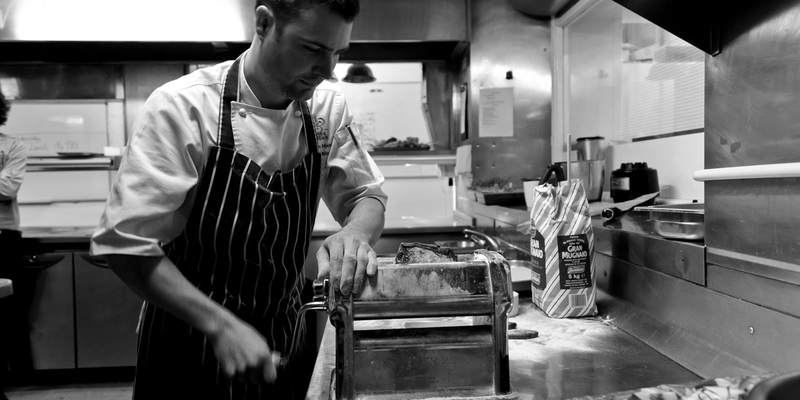 In 2015, under George Blogg’s direction, the restaurant was awarded three AA rosettes; he’s also won the Chef to Watch Editors’ Award from the Good Food Guide 2014, and an Acorn Award in 2011, which recognises rising stars in the hospitality industry. George Blogg’s food is classical, yet rather than redefine dishes by deconstruction, he works to refine the ingredients that grace his plates. His Glazed ‘tart’ of pig cheeks and penny bun, roasted celeriac, pear sorbet and wild cress, and Raspberry soufflé with buttermilk ice cream and raspberry and mint coulis are prime examples of how he upraises simple ingredients. This is classy-looking fare so it comes as a surprise when the chef elucidates that, essentially for him, substance takes priority over style: “[At Gravetye] we serve hotel guests and you want something that people can enjoy and think is lovely, and tastes amazing, and presentation should be after. First is flavour, second is texture and then… the presentation is in a style that looks pleasing but it is almost an afterthought.” After observing his beautiful dishes, we might have to disagree with him.